What are overnight Jewish camp grants? 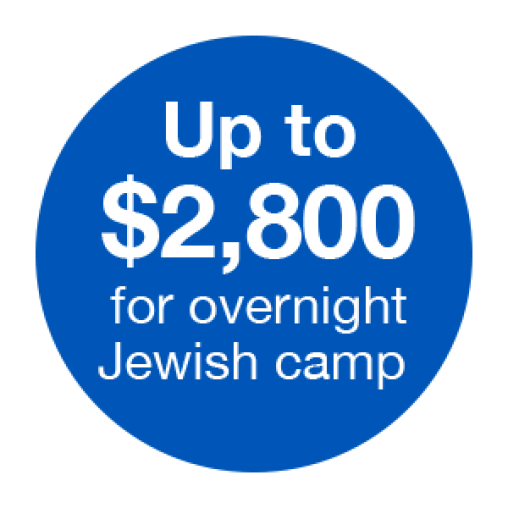 Through Cincy Journeys, every Jewish Cincinnati child is eligible for two grants for overnight Jewish camp—up to $1,800 one year and up to $1,000 a second year. Grants are available to children who have previously attended an overnight Jewish camp. Grants aren’t based on financial need, and can be used along with other scholarships or financial aid. Additional, need-based grants may be available for those who qualify. Please contact your congregational rabbi. How many times can I apply for an overnight Jewish camp grant? I have already attended an overnight Jewish camp but have never received a grant. Am I eligible for a first-year grant to this camp? Yes, “first-year” indicates that it is the first year you’re receiving a grant, not necessarily the first year you’re attending camp. I have already received one overnight Jewish camp grant. How many more grants can I receive? Must I apply for grants in two consecutive years? No. You can apply for grants for any two years you choose (as long as it's for an approved overnight Jewish camp). What is the exact amount of the first-time grant I can expect to receive? Campers attending a minimum two-week session are eligible to receive a grant of up to $900. Campers attending a minimum three week session are eligible to receive a grant of up to $1,800. What is the exact amount of the second-time grant I can expect to receive? Campers attending a minimum two-week session are eligible to receive a grant of up to $500. Campers attending a minimum three-week session are eligible to receive a grant of up to $1,000. How is Jewish camp different from other camps? For your child, Jewish camp is just plain fun. But it’s also so much more than that - it’s camp with a soul. Jewish camp isn’t just filled with Jewish campers. It is mission driven, weaving together Jewish values, culture, and traditions into the fabric of camp, helping campers to connect to their own identity and the larger Jewish community. Spirited and dynamic staff members use experiential learning to reveal what makes Jewish religion and culture so unique in today's world. At camp, Jewish and Israeli culture is celebrated through song, food, art, and dance. Each camp designs its own program to be accessible and enjoyable for all campers. Whether they’re telling stories in their bunks, learning about the environment, or playing tennis, campers explore what Judaism means to them in a safe, nurturing, and fun environment. Jewish camp does not equate to extended religious school in the summer. The 24/7 environment of camp creates a venue to celebrate Judaism in unique and vibrant ways, not offered in traditional settings. Why is Jewish camp important? The impact of Jewish camp is immediate—campers return home connected to a community and friends that will last them a lifetime. And it doesn’t stop there. Children with pivotal Jewish camp experiences are more likely to become adults who value their Jewish heritage, support Jewish causes, and take on leadership roles in their communities. Is Jewish camp too “religious” for my family? No matter your practice, there is a Jewish camp where your child will have fun, be comfortable and love being Jewish. Some camps are focused on Zionism and the role of Israel in Jewish life. Some camps are non-denominational, and focus on providing positive Jewish identity-building experiences through Jewish culture. Other camps are part of specific Jewish movements such as Reform, Reconstructionist, Conservative and Orthodox. Take the time to look at individual camps so you can see the differences. At certain camps, Hebrew immersion is an option if that is important to your families. At others, the celebration of Jewish culture is more subtle, infused into a Friday night Shabbat meal and joyful service. My child goes to Hebrew school. Why should they also go to Jewish camp? The magic of Jewish camp is rooted in its 24/7 atmosphere. Jewish values, connection to Israel, and the culture of Judaism are entwined with outdoor adventure, basketball, arts and crafts and swimming – creating a community of campers that are proud to be Jewish. But my child wants to go to a sports/arts/adventure camp. There’s a Jewish camp that’s perfect for your child. Jewish specialty camps enable your child to hone a specific skill or interest within the context of Jewish values like teamwork, fair play and ruach (spirit). Whether your child is interested in perfecting her jump shot, sharpening his painting skills, improving his swim stroke, directing a film, or learning how to farm organically, there is a specialty camp that fits their needs. Are their Jewish camps that offer programs for children with disabilities or special needs? Jewish camps offer a variety of models to accommodate special needs campers including mainstreaming, separate programming, and exclusive special needs camps specifically targeting children with autism, Down Syndrome, Asperger’s Syndrome, and others. Regardless of your child's function level, there is a Jewish camp ready to provide him or her with the summer of a lifetime. What exactly do you mean when you say “Jewish camp”? The Foundation for Jewish Camp supports over 150 nonprofit, mission-driven Jewish overnight camps across North America. These camps have a mission rooted in Jewish values, celebrate Shabbat in some manner, and instill a love of Israel.